Hanoi is the capital of Vietnam. The city has vibrant culinary traditions and the street food there is fantastic. Apart from Pho (beef noodle soup) and spring rolls, there are plenty other things to eat. We spent in Hanoi almost four days sightseeing, watching people and of course eating. 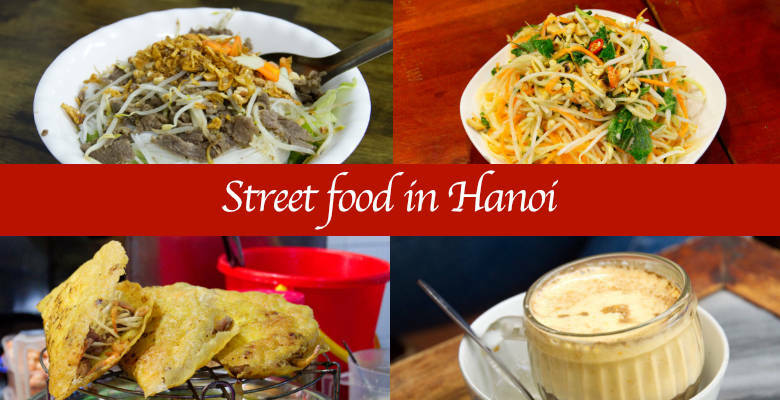 Today we will take you on the street food tour in Hanoi where we will show you the dishes that we have eaten and the restaurants or stalls we recommend. At the end of this article, there is a video from the tour, and we advise you to watch it, before going on the trip to Hanoi! We are huge fans of dry noodles, and on the first evening, we tried Pho Tron – rice noodles with chicken. We found this stall because of Food Ranger recommendation. Main ingredients of this dish are noodles, chicken thighs, peanuts, and herbs. The key to a tasty Pho Tron lies in the sauce that contains chicken broth, rice wine vinegar, and soy sauce. We added to the dish this fantastic garlic sauce (water? not sure if that the right word to describe it) and chili sauce. Later on, we decided to try some snails. Food Ranger recommended in his video a place close to our hotel, and we decided to find it. Unfortunately, the restaurant was full, and we had to order takeaway. The snails tasted amazing. They were cooked with lemon leaves, lemongrass, chili, and ginger. But the best was the dipping sauce which was made of fish sauce, sugar, vinegar, chili, garlic, lemongrass, lemon leaves and water. I can still remember how good these snails were! The next stop of our tour was the egg coffee. We went to the Cafe Giang which is one of the oldest coffee places in Hanoi. I have ordered the traditional egg coffee, and Matthias had the egg hot chocolate. The coffee was incredibly delicious! 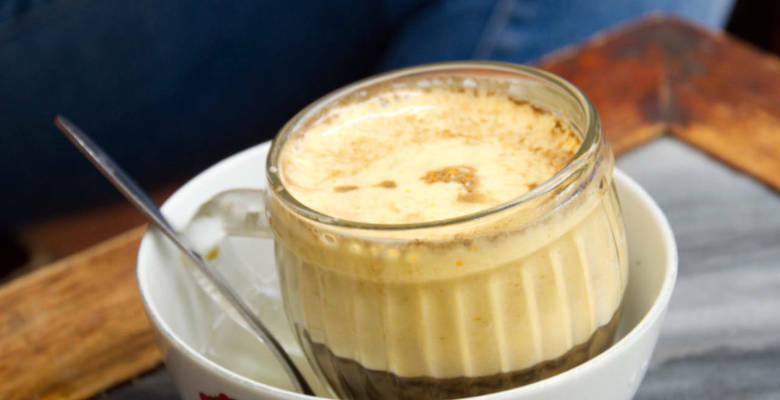 I have no idea how they made it, but we were told that the coffee is made of robusta coffee beans and the cream contains raw egg yolks, condensed milk, sugar, butter and apparently cheese. On our trip, we went to this coffee shop twice. The second time we have tried the egg coffee with rum, and that was as much highlight as the regular egg coffee. The place is pretty touristy but well, what can we do, the coffee is delicious! For dinner, we have decided to explore more delicious food, and we found this Banh Xeo stall. 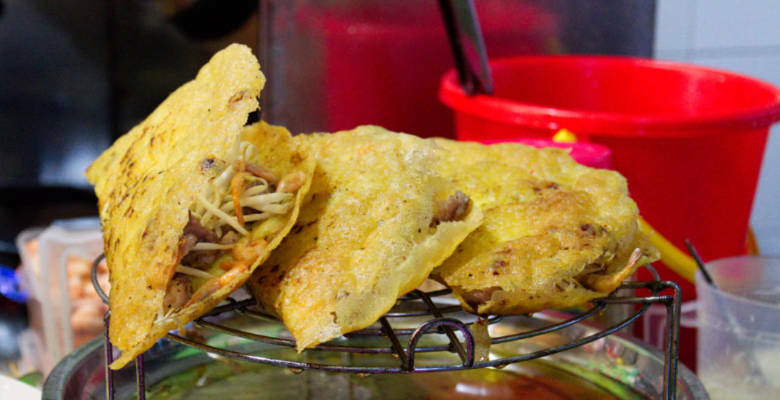 Banh Xeo is a crepe made of rice flour, filled with shrimps, bean sprouts, and pork slices. You eat it on a rice paper with some herbs and the famous Vietnamese dipping sauce. Banh Xeo was very crispy and very tasty. 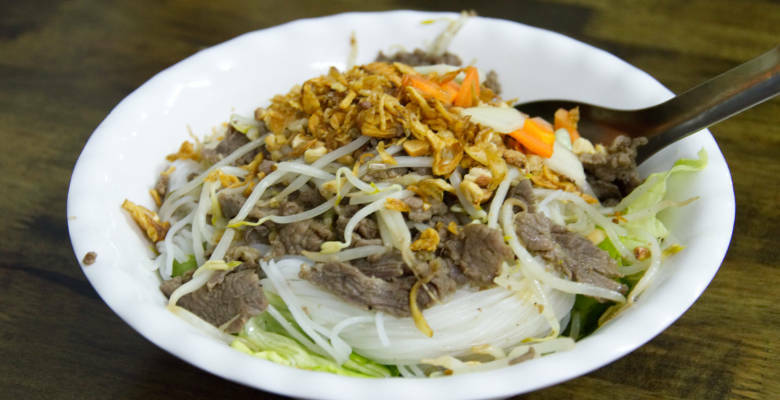 Certainly this type of the dish that you cannot miss on your trip to Hanoi! 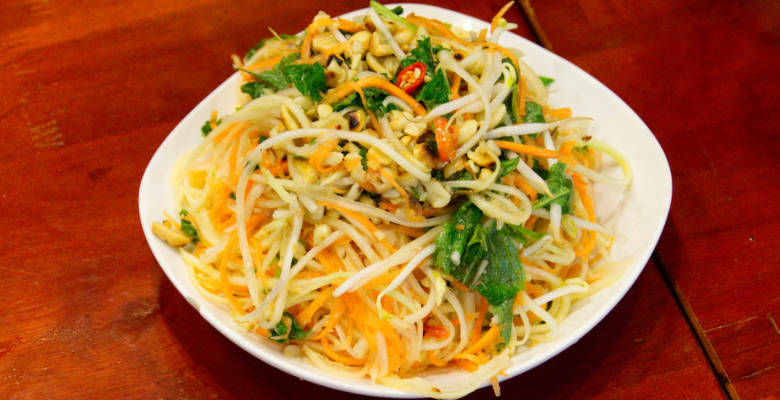 Papaya salad is very well-known in Southeast Asia and the salad taste differently in every south Asian country. After visiting Bangkok and trying papaya salad there, we decided to go for the Vietnamese version. What a taste! The Vietnamese papaya salad is less spicy, and the dressing is just unbelievable. The salad contains green papaya, carrots, cooked prawns, Thai basil, mint, coriander, onions, chili and roasted peanuts. The salad was very refreshing and incredibly delicious. I think that was my favorite papaya salad from the whole trip! The last dish of this evening was Bun Bo Nam Bo which is beef noodle salad made of thinly sliced rump steak, rice vermicelli, bean sprouts, cucumber, carrots, lettuce, mint, coriander, and onions. The meat is marinated and then stir-fried. The salad is served warm and tastes really delicious. That was a highlight of our trip, and you cannot miss this restaurant while visiting Hanoi! Don’t forget to subscribe our channel for future videos and click thumbs up if you enjoyed that video! Make sure you visit Food ranger channel for more food inspirations! Thanks for watching!